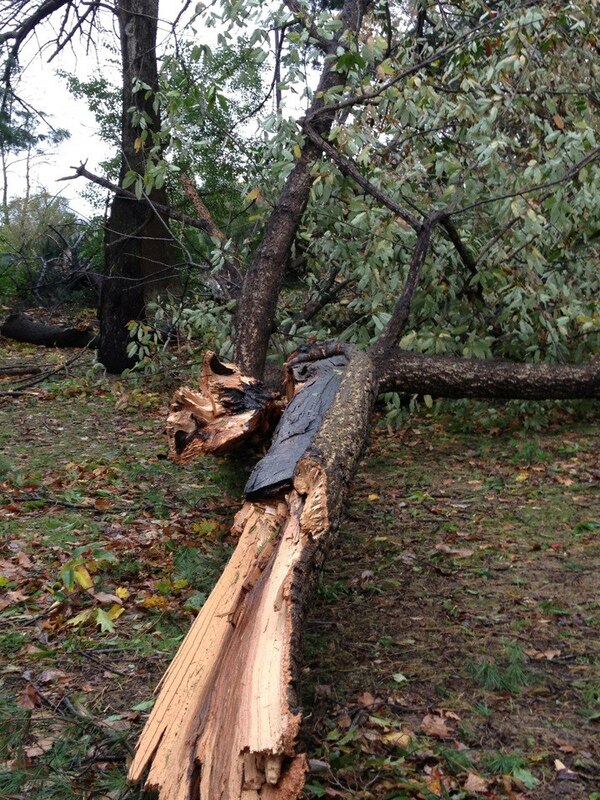 This tree was felled by Sandy last night and we came across it in our local park. Luckily she fell into the park, avoiding the road, the houses opposite and the power lines. In fact, the direction she fell could explain why we still have power when so many in our town are without. This time 24 hours ago I was hunkering down at home as the winds howled outside, rattling windows and making the trees around us bend and twist. It was more than a little terrifying. But I’m grateful that we’ve emerged unscathed, bar a fitful night’s sleep. We even have power when others in our town and the state do not. So many, from Haiti to close by us in New Jersey, have been so terribly affected. 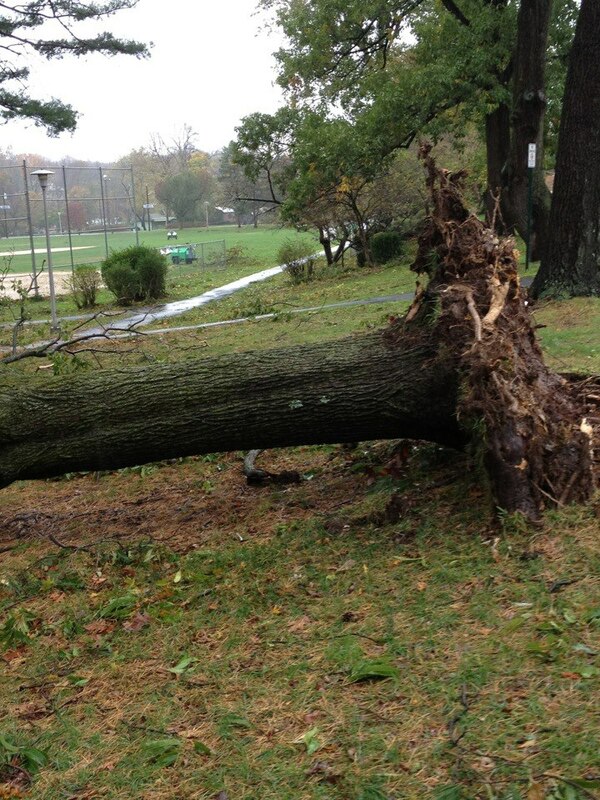 Hurricane Sandy was mother nature at her most devastating. So much has happened since I last posted. We packed up our life in London. We said goodbye to wonderful friends. We spent a month living on the 34th floor of a building in midtown, with spectacular views of the Manhattan skyline. We found an amazing house to rent in Maplewood, NJ. We’ve spent lots of time with my in-laws, which the children love (and we do too). And we moved into our house in Maplewood a little over a week ago. So to be suddenly faced with the worst storm in living memory was quite a challenge after the staid old weather we’d been used in London. We filled everything we could with water. We stocked up on candles and made sure our torches (or flashlights as I should say now I’m in America!) had batteries. We moved everything off the floor of the basement. We kept track of the storm online and we made contact with loved ones, both those in the path of the storm and those in Ireland and the UK. Walking around today, seeing the beautiful trees felled and maimed by the wind, made me think about how we’re putting down new roots even while these trees have been uprooted. I’m glad we’ve made the move, despite the sadness I felt leaving London and the wonderful life we had there. I’m hoping we build an equally happy life here in Maplewood. Things have been quiet on my blog lately…I wish I could say that life in general had been quiet, but it’s the very busy-ness of life that is leading to my blogging quietness! Recent highlights include my son (2.4) moving into his big boy bed (which is this one from Warren Evans – it’s extra narrow, which suits the tiny room and I highly recommend them and their amazingly lovely customer service) and my daughter (4 months) rolling (I was actually in the kitchen making dinner so missed it!). But in spite of this quietness, it appears I’ve not been forgotten…as the lovely Yummy Mummy? Really? has given me the Appreciation Award – I am so touched and delighted to receive it! It made my day when I found out! Yummy Mummy? Really? is a wonderful blogger, her posts are funny and well written and full of insights about modern motherhood. OK, so here are my answers to the questions. Colours are on my mind at the moment, as my son is learning them so every day involves him pointing out yellow cars and the like. But even as a child I found it hard to pick just one colour that was my favourite. I love red – bright, vibrant scarlet and have red shoes and clothes and lipstick. Putting red lipstick on instantly makes me feel glamourous (admittedly, I wear lipstick very infrequently these days!). But I also love green – calming and fresh, and associated with things like the smell of cut grass. And bright yellow – sunflowers and sunshine and happiness. Especially as it’s my son’s current favourite too. Again, I’m not sure I have just one favourite. For a pet, I love dogs. I look forward to when we can get a family dog, as I think that growing up with a dog to look after and walk and have fun with is wonderful. For a wild animal from these shores, I love hares. We were camping in Somerset over the Jubilee weekend and I had the privilege of seeing hares boxing. It was something I’d wanted to see since childhood! But I also love the urban foxes that I bump into around London (there are some living on a reservoir near us so myself and the children often bump into them on our wanderings). Their resourcefulness and adaptability are marvellous. Plus I loved Tom McCaughern’s books as a child – it’s probably what’s given me my lifelong love of foxes! For a bird, I’m a big fan of corvids, especially ravens. Such intelligence! On a related note, I often wonder what my dæmon would be if I were in His Dark Materials – a fox perhaps? Or a raven? Or an otter? This is an easy one – elderflower pressé – so refreshing! Hmm…Facebook. I dip in and out of Twitter but find it a bit overwhelming. Facebook allows me to keep in touch with friends and family. I much prefer giving presents. I hope I buy presents that people like and appreciate. I’d much rather buy something someone has asked for, if that’s what they prefer, as I think presents should be wanted. Having said that, I find it stressful to think of presents for myself and often just ask for ethical gifts (I’m always happy to get something from The Good Gifts Catalogue!). This is a tricky one – I’m on maternity leave at the moment so don’t have particular favourites during the working week. For instance, I loved Monday mornings at work – I used to get in at 8am, the whole floor would be quiet and I could make a nice coffee and sit back and read the weekend papers (which, luckily for me, counted as work!). I also loved Thursdays which was my day off with my son. I still like Thursdays – we go and see Jeremy singing in Finsbury Park cafe, or outside when the sun shines, and we all enjoy it. But I’d say Saturdays, when all four of us are together. And we still have Sunday to look forward to. Lily of the valley. And fuschia. And clematis (see above about being rubbish at choosing just one favourite!). I’m passionate about many things – my children, my husband, treating our planet and each other with respect and gentleness, feminism, living a life of integrity and joy. That list sounds a bit pretensous! I’m also passionate about cereal combinations (currently weetabix, porridge oats and rice krispies sweetened with honey though anything with wheatgerm is great! ), reading, Mumsnet and sleeping. I wonder what other things I’ll be passionate about as I grow older. Rachel over at Sparkling Bay – her blog about raising her daughter with a Montessori twist is excellent. Dilly over at Dillytante – I love this blog. She will make you want to go out and yarnbomb! I’m only choosing two, as my blogging reading is also quiet at the moment. So I really appreciate these two blogs, as they continue to entertain and inspire me at a time when I’m rarely online for any stretch. And as if on cue, my son has just fallen out of his bed for the first time. Time to sign off and hope it’s not too long before I blog again!